Dt. Sandhya Gugnani is a professionally qualified dietitian. Working as a consultant dietitian since 1997. Have a extensive experience of more than 15 +years with organizations like Honeywell, Hitachi, WHO, Sukhmani,Ozone Health Club, Zee Business and Paras Bliss. Dt. 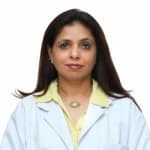 Sandhya Gugnani is a renowned Dietitian/Nutritionist in East Of Kailash, Delhi. She has had many happy patients in her 22 years of journey as a Dietitian/Nutritionist. She studied and completed MSc Food & Nutrition, PG Diploma, . You can visit her at Paras Bliss in East Of Kailash, Delhi. Save your time and book an appointment online with Dt. Sandhya Gugnani on Lybrate.com. Lybrate.com has a number of highly qualified Dietitian/Nutritionists in India. You will find Dietitian/Nutritionists with more than 35 years of experience on Lybrate.com. Find the best Dietitian/Nutritionists online in Delhi. View the profile of medical specialists and their reviews from other patients to make an informed decision. Is walking and jogging is good to reduce weight and belly fat. Reply me as soon as possible. Hi Both are good for physical and mental fitness. Weight loss is very minimal with both. You need to follow a good diet plan along with lifestyle change for good. I am looking like fat man please help me to lose weight can you teach me how to make fit man How much egg should we eat in elone day. I am gaining weight day by day so can you help me in losing my weight immediately. Hello, it is a most common problem for majority people of gaining weight. What we call obesity. It is very easy to gain weight by eating more than what you need. However at the same time it is very difficult losing weight. Only determined efforts can bring you some very good achievement in losing your flesh. First thing to avoid all types of junk food. Second thing not to eat till you are hungry. Thirdly walking with a motto-" and miles to before I sleep"-this will create healthy perspiration throughout your body. These all will make you slim earlier than you expect. Thanks. Is Homeopathy Good For Allergies? I want weight loss 20 kg till 5 Dec because my marriage fix in the December so please suggest me. I am kesavan, my age of 18, but my body weight is 42, so pls help for" how to improve my body? Hye, Thanks for the query. Firstly understand that weight gain is very dependent on genetics and metabolism along with your daily diet and exercise routine. It is important to know that just eating just two heavy meals a day will not help. Weight gain is all about taking more calories than you burn. Eating the right foods at the right time is very important. There is no one food that helps weight gain. Eat meals at frequent intervals. You need to eat at least 6 main and mid meals a day. Eat a mid meal between each main meal. Avoid junk foods. Include dairy, eggs, nuts, fruits, dry fruits, starchy vegetables, rice, bread, whole grain cereals, smoothies, masala milk, ghee, cream in your meals. Just eating sugary, sweet foods is not good. Try to have healthy deserts like kheer, chikki or lassi. Avoid alcohol and smoking. Exercise at least thrice a week. It helps development of muscle mass and improves appetite. Even if you were to take just medicines or supplements they will not work in isolation. You need to have a calorie and nutrient dense meal and good exercise routine, it's crucial. Hello. I'm 24 years old and I'm 5.8' tall. But my weight is just 48. I look very lean. So suggest me how to gain weight naturally. With out using steroids. Hello, Gaining weight is a slow process which requires patience and dedication! It not only depends upon the amount of food you consume daily, but also about eating Sensibly, depends upon your genes, your body's proper metabolism, assimilation and absorption, the levels of stress/ tension in your life, and any underlying medical condition you have! The food what and how you eat, makes the difference! For increasing your weight, concentrate on the below points (if you don’t have any medical condition) which helps in gaining weight in a right way without harming your body. - Consume more healthy fats. Foods containing healthy fats are full of nutrients and also high in calories, making them a great option for weight gain. Foods containing plant fats should be your first option - this includes items such as nuts, seeds, peanut butter, avocados and olive oil. Foods containing healthy animals fats include lean meats and full fat dairy products - although if you have high cholesterol, you should probably stick to low-fat options. -Eat more protein. Good sources of protein include lean meat, fish and poultry, in addition to eggs, whole grains, dairy products and legumes. -Drink more calories. Try drinking a large glass of orange juice in the mornings (along with your normal breakfast). Drink a glass or two of full-cream milk throughout the day. -Have 6 small and frequent meals in a day. -Gain muscle mass. It's a good idea to continue to exercise while you attempt to gain weight the healthy way. Strength training includes working with weights and performing exercises such as squats, deadlifts, bench presses, bicep curls, crunches, chin-ups and leg curls. Just keep in mind that the more you exercise, the more calories you will need to consume to replace those you lost while working out. -Quit smoking. As it suppresses the appetite. -Stay healthy. The most important thing through the entire weight gain process is to stay healthy - eating a balanced diet and continuing to exercise throughout. -Take enough of rest and sleep for rejuvenation of the cells and tissues. -Think Positive which will help you in achieving your target of gaining weight. -Avoid taking unnecessary stress/ tension. Medication: Take Schwabe’s Alfaalfa Tonic and Five Phos. Both thrice daily ½ an hour before meals for 3 months. Revert. My BMI is 31. I'm a fitness freak and regularly devote 1 hr. Daily for exercising. I'm also diet conscious and avoid sugary and salty foods. Despite all these I'm not loosing weight which hovers around 102 to 104 kgs. What should i do for bringing my weight down to a level of 72-74 kgs. Please Advise me. Just by avoiding sugary and salty food, you wont be able to do much about your weight. You also need do look at your fat intake. Also, controlling your portions is important. Again, how you distribute your total days intake should also be taken into account. So it is better to go for a detailed consultation on diet and get a proper diet plan. Regarding exercise, if one hour of physical activity is your standard, then you might have to increase your physical activity in order to achieve the desired weight loss. In today's post lets understand which are the foods we should avoid as they can cause more harm than doing any good to us when eaten during monsoon as they laden with germs. -Raw Foods-While eating raw food is good for the health,it can be risky to have the same during monsoon as the chances of germs and infections increase.So during this season its best if we can boil or steam the vegetables before eating.Also lets make sure we wash the fruits really well before eating and eat them immediately after cutting them to reduce the chances if germs. -Juices From The Street Vendors-Juices sold on the roadside should be avoided as they can be made out of stale fruits or fruits which are cut well in advance and we also not sure of the kind of water being used which increases the risk of getting infected by water borne diseases like jaundice, diarrhoea or any other water-based bacterial infection.We also need to avoid fruits salad available as they are cut well in advance.Its always best if we prepare our juices at home using fresh fruits and consume it immediately. -Leafy Vegetables-We all know the health benefits of green leafy vegetables.But its best to avoid them during monsoon as they are grown in swamps and the dampness, dirt and mud present in the leaves make these veggies more susceptible to many germs, leading to different stomach infections. -Fried Foods-Pakoras and bhajiyas is a favorite with all of us during monsoon with our cup of garam chai.But it is best to avoid or eat less of fried foods during monsoon and science backs it up too.During this season our digestion process slows down and consuming the delectable spread of pakoras,samosas and kachodi can cause gastronomical complications like bloating and stomach upset. I wan to reduce weight. Have gained lot of weight in last few months and have been looking to find a way to reduce it now plead help me out. Hello lybrate-user. Both things are important for reducing body weight. 1st its proper 30 to 45 minutes workout or brisk walk and 2nd its diet control or taking healthy nutritive diet. Drink warm water with lemon and honey early in the morning. Maximum intake of green tea and water dinner it should be light maximum till 8 pm. Avoid sugar refined fatty food. And for diet chart you can consult me on my private Lybrate account.